PORTSMOUTH, Va. (WAVY) - It takes hard work and dedication to be an actual life saver. The Volunteer Rescue Squads of Virginia Beach is the largest volunteer EMS system in the country, and they need your support in order to support us all. Volunteers undergo months of training and then commit to working multiple 12-hour shifts per month. Many work full-time jobs in addition to the time they dedicate to the squads. Each of the 10 squads is a nonprofit responsible for purchasing its own vehicles, equipment and uniforms. Additionally, because of the community's support, they are able to offer FREE pre-hospital emergency care to Virginia Beach residents and visitors. That's more than 40,000 calls annually! For more information on how you can support Volunteer Rescue Squads of Virginia Beach visit LivesNeedSaving.org and click the "donate" button. That's the same place you would go if you're interested in joining the team. 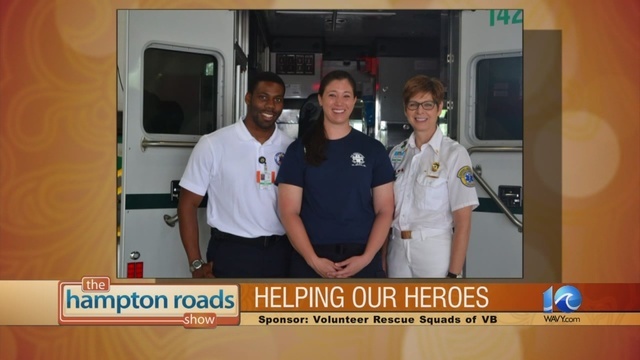 This segment of The Hampton Roads Show is sponsored by Volunteer Rescue Squads of Virginia Beach.